The ability of S. pneumoniae to generate infections depends on the restrictions imposed by the host’s immunity, in order to prevent the bacterium from spreading from the nasopharynx to other tissues, such as the brain. Some authors claim that strains of S. pneumoniae, which fail to survive in the bloodstream, can enter the brain directly from the nasal cavity by axonal transport through the olfactory and/or trigeminal nerves. However, from the immunological point of view, glial cells are far more responsive to bacterial infections than are neurons. This hypothesis is consistent with several recent reports showing that bacteria can infect glial cells from the olfactory bulb and trigeminal ganglia. Since our group previously demonstrated that Schwann cells (SCs) express a functional and appropriately regulated mannose receptor (MR), we decided to test whether SCs are involved in the internalization of S. pneumoniae via MR. Immediately after the interaction step, as well as 3 h later, the percentage of association was approximately 56.5%, decreasing to 47.2% and 40.8% after 12 and 24 h, respectively. Competition assays by adding a 100-fold excess of mannan prior to the S. pneumoniae infection reduced the number of infected cells at 3 and 24 h. A cytochemistry assay with Man/BSA-FITC binding was performed in order to verify a possible overlap between mannosylated ligands and internalized bacteria. Incubation of the SCs with Man/BSA-FITC resulted in a large number of intracellular S. pneumoniae, with nearly complete loss of the capsule. Moreover, the anti-pneumococcal antiserum staining colocalized with the internalized man/BSA-FITC, suggesting that both markers are present within the same endocytic compartment of the SC. Our data offer novel evidence that SCs could be essential for pneumococcal cells to escape phagocytosis and killing by innate immune cells. On the other hand, the results also support the idea that SCs are immunocompetent cells of the PNS that can mediate an efficient immune response against pathogens via MR.
Streptococcus pneumoniae is a Gram-positive bacterial pathogen that commonly colonizes the human respiratory tract. The ability of S. pneumoniae to generate infections depends on the restrictions imposed by the host’s immunity, in order to prevent its spread from the nasopharynx to other tissues and sites, such as the middle ear, lungs, blood, and brain . The means by which some strains of S. pneumoniae invade the brain without the occurrence of bacteremia are still unknown. Some authors claim that strains of S. pneumoniae, failing to survive in the bloodstream, can enter the Central Nervous System (CNS) directly from the nasal cavity by axonal transport through the olfactory nerves or trigeminal ganglia . However, from the immunological point of view, glial cells are far more responsive to bacterial infections than are neurons, and therefore more likely to internalize them. This hypothesis is consistent with several recent reports showing that bacteria can infect glial cells from the olfactory bulb and trigeminal ganglia, such as Olfactory Ensheathing Cells (OECs) and Schwann cells (SCs), respectively –. SCs are glial cells that are closely associated with the peripheral nerves, and can be classified into two types: myelinating and non-myelinating. Myelinating Schwann cells provide the myelin sheath of individual axons, and non-myelinating Schwann cells ensheathe several small axons. Both SC phenotypes can interface with the external environment through nerve endings scattered in the mucosa, and thus can potentially interact with pathogens. Several lines of evidence suggest that SCs can function as sentinel cells in the peripheral nervous system (PNS), and are a potent source of cytokines and innate immune receptors (pattern recognition receptors [PRRs]), such as Toll-like receptors (TLRs) and Mannose Receptors (MR), which are capable of controlling adaptive immune responses against self- and non-self antigens –. MR is a 175-kDa transmembrane glycoprotein receptor that contains multiple domains in the extracellular region, including Ca2+-dependent lectin-like carbohydrate recognition (CTLD), responsible for the binding to mannose, fucose, and N-acetylglucosamine, present in small molecular motifs called pathogen-associated molecular patterns (PAMPs) and damage-associated molecular patterns (DAMPs) –. MR has emerged as an important component of the innate immune system, participating in host defense following microbial infections. This receptor can initiate host mechanisms to remove pathogens, most specifically through activated macrophages. However, other cell types express MR in a functional state able to recognize and internalize microbial components . MR is involved in the innate immune response in several tissues ,, including normal and injured nerve tissue, where it was found to express in microglia, astrocytes, immature neurons, Schwann cells, and olfactory ensheathing cells ,,,,. However, there is no evidence that either mature oligodendrocytes or their precursors express MR .
By using different models of interaction with some highly mannosylated ligands, our group previously demonstrated that SCs express a functional and appropriately regulated MR ,. We also demonstrated that SCs may harbor infectious agents and act as safe hosts by producing immune mediators ,. In the present study, we evaluated whether SCs cultured from the adult sciatic nerve are able to internalize S. pneumoniae via RM. One-month-old Wistar rats were used to obtain primary SC cultures. Animal care and euthanasia procedures followed the norms established by the Brazilian Society for Neuroscience (SBNeC), as well as by the ethics committees of the Institute of Biophysics Carlos Chagas Filho of the Federal University of Rio de Janeiro (IBCCF/UFRJ - Permit Number: 158). Primary rat SCs were obtained according to a modification by P.M. Wood of the procedure described by Morrissey et al. . Briefly, sciatic nerves were harvested in Leibovitz’s L 15 Medium (Invitrogen, Carlsbad, CA, USA), fragmented, and cultured in Dulbecco’s Modified Eagle’s Medium (DMEM; Invitrogen) containing 10% heat-inactivated fetal calf serum (FCS; Cultilab, Campinas, Brazil). After 30 days, the nerve fragments were treated with 0.5 mg/ml collagenase type I (Worthington Biochemicals, New Jersey, NJ, USA) and 1 mg/ml dispase II (Roche Molecular Biochemicals, Indianapolis, IN, USA) overnight in a CO2 incubator at 37°C for dissociation. After washing, the cells were cultured in dishes covered with a solution containing poly-L-lysine (200 μg/ml, Sigma Chemical, St. Louis, MO, USA), in DMEM containing 10% FCS, 100 U/ml penicillin (Invitrogen), 100 μg/ml streptomycin (Invitrogen), 2 μM forskolin (Calbiochem, La Jolla, CA, USA), and 20 μg/ml bovine pituitary extract (Biomedical Technologies, Stoughton, MA, USA). After the first passage, SCs were further selected from fibroblasts by using an anti-mouse Thy 1.1 antibody (undiluted hybridoma culture supernatant, American Tissue Culture Collection, Manassas, VA, USA) and rabbit complement (Sigma). This resulted in approximately 97 - 99% pure SC cultures as assessed by S100-β (DAKO, Carpinteria, CA, USA) immunoreactivity. SC-enriched cultures were maintained in a humidified air/CO2 (95%/5%) atmosphere at 37°C. Because a limited amount of primary SCs was available, pilot experiments were performed with the ST88-14 tumor cell line (Schwannoma cells). The ST88-14 cells, isolated from a patient with neurofibromatosis type 1 , were kindly donated by J.A. Flechter (Dana-Farber Cancer Institute, Boston, MA, USA). For inclusion in the present study, the cells were grown in RPMI 1640 medium supplemented with 5% FCS, 1 mM glutamine, 1000 U/ml penicillin, and 50 μg/ml streptomycin. All chemicals were from Sigma. The cells, plated in culture dishes or on cover slips in 24-well plates (Falcon, Franklin Lakes, NJ, USA), were maintained in a humidified air/CO2 (95%/5%) atmosphere at 37°C for 24 h.
The SCs cultures, both ST88-14 cells and Schwann cell primary cultures, were treated with PBS + 0.3% Triton X-100 (Sigma) and blocked with 10% normal goat serum (NGS). For phenotypic identification of SCs, the cultures were incubated with mouse monoclonal antibody anti-S100-β (Sigma), a Schwann cell marker . After reaction with the primary antibodies of interest, cells were incubated with goat anti-rabbit IgG and/or goat anti-mouse IgG secondary antibodies. Soon after, the cells were washed in PBS pH 7.4 and mounted with N-propylgallate in PBS-glycerol and coverslipped. SCs were tested for the expression of MR by labeling with a polyclonal antibody, produced in rabbits, directed against a C-terminal peptide of murine MR (anti-cMR, 1/100), kindly donated by Dr. Anne Régnier-Vigouroux . A cytochemistry assay with 50 μg/ml of the neoglycoprotein mannosyl/bovine serum albumin-FITC-conjugated (man/BSA-FITC, Sigma) diluted in Ringer solution containing 5 mM CaCl2 and 1% BSA at 37°C for 1 h was performed in order to confirm the internalization pattern in SCs. Both expression and functional analyses (MR-mediated endocytosis) of the MR in SCs were performed as previously described by us in detail ,. Strain S. pneumoniae ATCC 49619 (American Type Culture Collection 49619) was selected for performing interaction assays with SCs, based on the facts that (1) it is a reference strain widely used in medical microbiology research and diagnostic laboratories worldwide; and (2) it belongs to serotype 19 F, which is frequently associated with pneumococcal infections in many parts of the world and is often linked to resistance to penicillin and other antimicrobial agents . For interaction assays, bacterial cells were obtained by streaking strain ATCC 49619 on 5% sheep blood agar plates (Plast Labor, Rio de Janeiro, RJ, Brazil). After incubation at 37°C for 20 h under 5% CO2 atmosphere, individual colonies were selected and cells were suspended in Hanks' balanced salt solution (HBSS; Sigma) to reach a turbidity equivalent to the 0.5 McFarland standard. To reduce cell clumping, the bacterial suspension was passed 15 times through a 27-gauge needle and then allowed to settle for 15 min. Only the top fraction of the suspension containing dispersed bacteria was used to infect SCs. This dissociation method was used only in the case of bacterial clumping. First, we determined the number of SCs using a Neubauer Chamber. Next, the bacterial inoculum was determined by McFarland Turbidity Standards. SC cultures were infected with suspensions of living S. pneumoniae ATCC 49619 cells in a ratio of 100:1 bacteria/SC cells for at least 3 h in serum- and antibiotic-free DMEM F-12. After this period, the cultures were rinsed with PBS to remove non-adhered bacteria, DMEM F-12 was added, and the infection was followed at 37°C for up to 24 h, with fixation of infected cells at 3, 12, and 24 h after PBS rinsing. The number of SCs associated with S. pneumoniae was determined after 3, 12 and 24 h.
For the dark-field microscopy analyses, the infected and uninfected cultures were washed in PBS and fixed. The samples on cover slips, previously fixed in 4% paraformaldehyde at room temperature, were permeabilized with PBS-Triton 0.3% and blocked with 10% NGS ,. After that, bacteria were detected by using a Pneumococcal anti-serum (OMNI States Serum Institut, Copenhagen, Denmark) and/or stained with 0.1 mg/ml 4’,6-diamidino-phenylindole (DAPI, Sigma). The viability of the bacteria was examined using fluorescent microscopy after staining with 5 mM SYTOX Green nucleic acid stain (Invitrogen) . Competition assays were performed by infecting cultures in the presence of 100 μg/ml of mannan (hyper-mannosylated glycoprotein from Saccharomyces cerevisiae - Sigma) after testing concentrations in the range of 10 to 1000 μg/ml (10, 100, 500, and 1000 μg/ml) ,, for 3 to 24 h. A cytochemical assay with (Man/BSA-FITC) binding was performed in order to determine the presence of a MR with the active CTLDs. Other infected cultures were incubated with 50 μg/ml man/BSA-FITC as described above. The glass coverslips were then removed from each well and mounted on glass slides with entellan glue plus 90% glycerol in PBS containing 1 μg/ml p-phenylenediamine . Samples were analyzed using a Zeiss epifluorescence photomicroscope (Zeiss, Jena, Germany) and a set of 200 cells was examined for the presence of S. pneumoniae. In addition, the percentage of cells with associated bacteria (adhered or internalized) was calculated as follows: number of infected cells/200 cells × 100. Cells were seeded at a density of 1.2 × 106 cells/ml in DMEM F-12 medium plus 10% FCS on poly-L-lysine plus laminin-coated glass coverslips for 30 min at 37°C and mounted in N-propylgallate (Sigma) in PBS-glycerol. The samples were placed under a Leica TCS SP5 confocal microscope (Leica Microsystems, Heidelberg, Germany) and all images were acquired with a 63X glycerol immersion objective lens. Image treatment was performed using the Image Processing Leica Confocal and ImageJ Software (Wayne Rasband, National Institutes of Health, Bethesda, MD, USA). The three-dimensional sections perpendicular to the plane of the monolayer and parallel to the x or y axis were reconstructed using Leica Application Suite Advanced Fluorescence (LAS AF) software. Statistical analyses of the data from assays of competition and of cell/bacteria association were performed with One-way ANOVA followed by the Tukey test for multiple comparisons. In case of single comparisons, the Student t test was applied. P values equal to or less than 0.05 were considered statistically significant. The present study is focused on the interaction between S. pneumoniae, a major agent of bacterial meningitis, and glial cells, which are currently considered as part of the innate immune system, forming a first line of defense against infections of the nervous system. We used a model of infection of glial cells by S. pneumoniae. This model was improved during previous studies by our group, which showed that the bacterial load and time course of infection are crucial in this in vitro model . Recent studies have shown that glial cells are highly reactive to pathogens, through regulating inflammation, and participating in innate and adaptive immunity ,–. In the specific case of SCs, it has been shown that, similarly to microglia in the brain, they may act as sentinel cells in the PNS and thus orchestrate the induction of a host defense response ,. Recent data from our group indicate that SCs from the rat sciatic nerve and a human SC line (ST88-14) express MR in a functional state capable of internalizing mannosylated ligand ,. 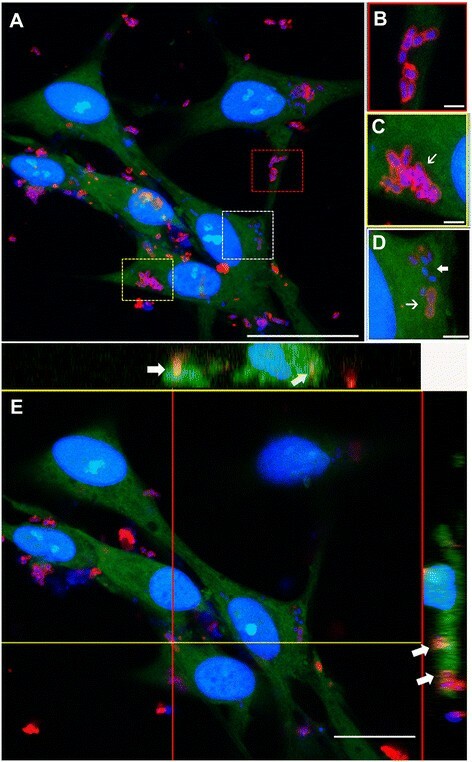 We also have previously shown that cells egress from sciatic nerve explant cultures treated with IFN-γ, MHC class II staining colocalized with internalized neoglycoprotein in perinuclear areas of cells phenotypically identified as SC . These findings are consistent with a possible role of SC in the clearance of DAMPs and PAMPs, acting as facultative antigen-presenting cells during inflammation. Furthermore, we have previously demonstrated that a human SC line (ST88-14 cells) is able to internalize promastigote forms of Leishmania amazonensis and that, in subsequent steps to infection, the parasite triggers cellular signal transduction pathways, inducing the nuclear translocation of the nuclear factor-kappa B (NF-kappa B) . The ST88-14 SC line is a good model for the present study because these cells express some phenotypic markers of normal SCs . In view of this and because a limited amount of primary SCs and an overwhelming quantity of ST88-14 cells were available, the pilot experiments were performed with ST88-14 cells. After standardization of the protocols, the same tests were repeated with primary SCs. No significant differences were observed between the two cell types in any of the experiments. To confirm the Schwann-like nature of our ST88-14 cells and the purity of the SC preparation obtained from primary cultures, both cultures were incubated with polyclonal anti-S100-β antibody. All or virtually all ST88-14 cells showed marked positivity for S100β protein (not shown). Correlative microscopy of images obtained in phase-contrast and confocal immunofluorescence optics showed S100-β+ cells, and revealed a high degree of purity in our primary SC cultures (Figure 1B). The purity of isolated primary SCs exceeded 97 - 99%, as previously described by our group . Incubation of fixed SCs with the cMR antibody resulted in distinct labeling, widely distributed both on the surface and in the cytoplasmic domain (different optic planes selected from z-series) of SC from primary nerve cultures (Figure 1C), confirming our previous data . Omission of the primary antibodies eliminated the respective labeling (not shown). In an initial approach, we evaluated whether SCs could harbor S. pneumoniae in an in vitro model of infection. Our results revealed a variable number of internalized bacteria throughout the cytoplasm of SCs (Figure 1A). To confirm that the MR was involved in the uptake of S. pneumoniae, SCs were reacted with anti-cMR. In order to solve the problem caused by the use of two antibodies produced in rabbits, the bacteria were revealed with DAPI. 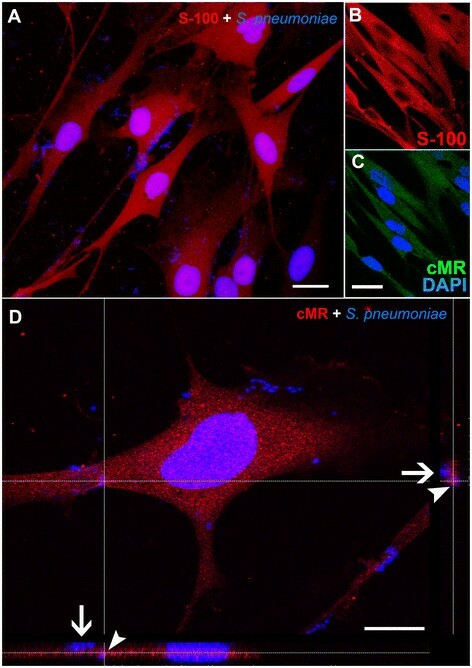 These results showed an intense immunoreaction with anti-cMR in intracellular compartments containing S. pneumoniae (Figure 1D) of SCs previously identified by the anti-S100-β antibody (Figure 1A). Confocal microscopy images showing expression of the mannose receptor (MR) in uninfected and infected Schwann cells (SCs) by Streptococcus pneumoniae . (A) Optical sections showing the expression of S100-β in infected Schwann cells (SCs) cultured from the adult sciatic nerve. (B and C) Double immunolabeled images, showing in B, uninfected SCs labeled for S100-β in red (maximum nuclear diameter), and in C, the same cells immunolabeled for the mannose receptor (cMR) conjugated with Alexa Fluor 488. The same field demonstrates that all S100-β+ cells are also labeled with cMR (plane at or near the free surface of the membrane). (D) Optical section, where SCs infected by S. pneumoniae for 3 h were immunolabeled for cMR (red). Bacteria were stained with DAPI (blue). Orthogonal z-sections in the horizontal and vertical planes reveal S. pneumoniae adhered (arrow) or internalized (arrowheads) by SCs (D). The nuclei were counterstained with DAPI. These results are representative of five separate experiments. Scale bar = 18 μm in (A); 18 μm in (B - C); 12 μm in (D). To monitor the course of infection, the number of SCs containing adhered and/or internalized S. pneumoniae was quantified at different times up to 24 h. Immediately after the interaction step, as well as 3 h later, the percentage of association was 56.5%, and decreased to 47.2% and 40.8% after 12 and 24 h, respectively (Figure 2). Kinetics of association (adhesion or internalization) of Streptococcus pneumoniae with Schwann cells (SCs). The percentage of SCs containing adhered or internalized S. pneumoniae was quantified at different times up to 24 h. The graph shows a progressive decrease in the number of S. pneumoniae associated with the SCs. These data are representative of three separate experiments, each of which was conducted in triplicate. ***P <0.0001. For statistical analysis, we used Two-way ANOVA and Tukey’s Multiple Comparison Test. We evaluated the endocytosis of S. pneumoniae by SCs, maintained either in medium alone or in medium containing an excess of mannan, according to a protocol previously described by us for the endocytosis of S. pneumoniae by OECs . Observations were made after interaction of S. pneumoniae with SCs for 3, 12, and 24 h in both conditions. Variable numbers of internalized bacteria as detected by labeling with anti-pneumococcal antiserum and counterstained with DAPI were seen throughout the cytoplasm of SCs maintained in medium alone (Figure 3, detailed in Figure 4A-E). On the other hand, the interaction assays performed in the presence of mannan impaired the bacterial binding to the cellular surfaces, thus drastically reducing the number of infected cells after 3 h of association (Figure 3). However, the number of infected cells was not significantly affected from 3 to 24 h of infection in the mannan-treated cultures (Figure 3). Competition assays showing the participation of mannose receptor (MR) during the association of Streptococcus pneumoniae with Schwann cells (SCs). The assays were performed by adding increasing doses of mannan (10 to 1000 μg/ml) in the interaction medium, and the results were highly statistically significant (***P <0.0001) at a dose equal to or higher than 100 μg/ml. 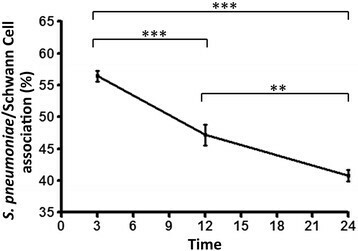 The graph shows an inhibition of the percentage of SCs with associated bacteria immediately after 3 h of association (black bar versus white bar). However, this percentage was not significantly affected after this time up to 24 h of infection in mannan-treated cultures (black bar versus dark-gray bar). These data are representative of three separate experiments, each of which was conducted in triplicate. For statistical analysis, we used Two-way ANOVA and Tukey’s Multiple Comparison Test. Confocal microscopy analysis of the mannosyl/bovine serum albumin-fluorescein isothiocyanate (man/BSA-FITC) colocalization with Streptococcus pneumoniae capsule in Schwann cells (SC). (A) Optical section of infected Schwann cells cultured for 48 h, immunolabeled for anti-pneumococcal antiserum (red) and reacted with Man/BSA-FITC (green). Active CTLDs of MR in infected SCs were observed after receptor-ligand binding assays with Man/BSA-FITC (red, yellow and white dashed squares in A). Higher-magnification views of the red, yellow and white boxes in A show details of S. pneumoniae adhered to the cellular surface (B) or internalized by SC in C and D. Internalized bacteria can be seen throughout the cytoplasm of the SCs (thin arrows in C and D), some of which lack the polysaccharide capsule (thick arrow in D). (E) Optical section at the maximum nuclei diameter of A with the orthogonal plane images cut at the yellow and red lines, and projected in the upper and right columns, respectively. Orthogonal projections show colocalization of both markers (arrows). The nuclei of SCs and/or bacterial DNA (blue dots) are stained with DAPI. The DAPI counterstaining shows the bacterial DNA surrounded by intense labeling of the pneumococcus capsule that reacted with the anti-pneumococcal antiserum (B - D). These results are representative of five separate experiments. Scale bar = 30 μm in (A); 1.5 μm in (B); 2 μm in (C - D); 18 μm in (E). The results of the present study suggest that MR is involved in infection of SCs by S. pneumoniae in a specific manner. Competition assays conducted by adding a 100-fold excess of mannan prior to the infection with S. pneumoniae, confirmed the participation of MR during the association of bacteria with SCs. 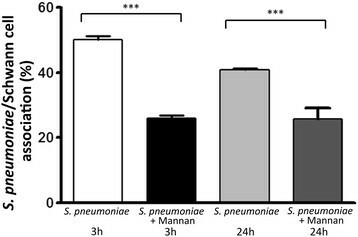 This result suggests the presence of a receptor-ligand recognition system employed by S. pneumoniae for invasion of the SCs, since incubation of the cell cultures with latex beads 2 μm in diameter (non-mannosylated particle) did not result in a change in the number of infected SCs (not shown). The reduction in the percentage of infected SCs after 12 and 24 h of association can also be attributed to a phenomenon known as pneumococcal fratricide, which causes the activation of LytA to disrupt completely the cell wall of noncompetent bacteria. –. We hypothesized that this fratricide phenomenon may also explain why no differences were found between 3 and 24 h of infection in mannan-treated cultures, since competition of bacteria/mannan for binding sites on the cell surface may have selected bacteria with different abilities to cause infection prior to saturation of these sites. Similar results were obtained in our previous studies on the interaction of OECs with S. pneumoniae, indicating the presence of a functional MR expressed on the OECs cellular surface, which binds the capsule from bacteria in a mannan-inhibitable manner . Previous studies using animal models have shown that the capsular polysaccharide might influence the proportion of bacteria capable of adhering to and invading the cells . Other studies suggest that polysaccharide conformation may play an important role in pneumococcal recognition . Additionally, the MR was found to bind to purified capsular polysaccharides of S. pneumoniae and to the lipopolysaccharides, but not capsular polysaccharides, of Klebsiella pneumoniae. However, no direct correlation can be made between polysaccharide structures and recognition by MR, since, although they were Ca2+-dependent and inhibitable by D-mannose, these polysaccharides had none of the structural features often associated with known MR . It may be possible that S. pneumoniae changes some capsular structures after an initial contact of their mannosylated residues with the MR of the host cell surface, and hence may also interact with other non-lectin domains of the receptor. The morphology of the bacteria was analyzed by confocal microscopy. As might be expected, adhered bacteria were easily recognized by their uniform size, smooth contour, and neat arrangement in diplococcus-shaped pairs, similar to the appearance commonly observed in bacterial cultures. There were no significant morphological changes in the extracellular bacteria before or after the experiments. Cytochemistry assays with Man/BSA-FITC binding were performed in order to verify a possible colocalization between a mannosylated ligand and internalized S. pneumoniae. Similarly to the report in our previous studies ,, incubation of uninfected SCs with Man/BSA-FITC showed an intense labeling, widely distributed on the cellular surface and also in the intracellular domain. However, this pattern was not significantly affected by bacterial infection. For negative controls, the same Man/BSA-FITC reactions performed in the presence of 250 mM D-mannose resulted in loss of the Man/BSA-FITC labeling in SC tagged by anti-S100-β antibody (not shown). S. pneumoniae was localized predominantly in cytoplasmic compartments, with intense staining for Man/BSA-FITC, presumably defining edges of the vesicles (Figure 4A, C and D). Only small numbers of S. pneumoniae were bound to the SC surface (Figure 4B). Moreover, the anti-pneumococcal antiserum staining colocalized with the internalized man/BSA-FITC, suggesting that both markers are present within the same endocytic compartment of the SC (Figure 4E). Interestingly, incubation of the SCs with Man/BSA-FITC resulted in a large number of intracellular S. pneumoniae cells with a nearly complete loss of the capsule (Figure 4D). In addition, large numbers of S. pneumoniae internalized by SC in a nonencapsulated form were observed after 3 h of infection, but no substantial loss of bacterial viability was observed under these conditions after washing and recovery of living bacteria from the lysed cell host. Nevertheless, we cannot rule out this possibility, since previous studies showed that during alveolar macrophage infection, significantly more intracellular nonencapsulated S. pneumoniae were killed than the capsulated form . In fact, we observed a reduction in the number of infected cells immediately after 3 h of association of S. pneumoniae with SCs followed at different times up to 24 h. Several aspects may be associated with this finding, including the ability of bacteria to escape from endocytic vesicles and then migrate to the extracellular environment , or die, either immediately after the adhesion or during internalization . However, continued studies are necessary to better understand this mechanism in our model. Our study provided new insights into the molecular and cellular mechanisms by which S. pneumoniae can gain access to the CNS in the absence of bacteremia. The nasopharynx and maxillary sinuses are richly innervated by myelinated and non-myelinated sensory axons (and their associated Schwann cells) from the trigeminal nerve; thus, it can be predicted that any infection of SCs in these regions could provide a means of transport for S. pneumoniae toward the brain along the peripheral nerves. Moreover, considering that S. pneumoniae is a common commensal in the nasopharynx of healthy adults and children, any surgical procedure in this region could result in a risk of contamination. Actually, pneumococcal meningitis may occur as a postoperative complication, due to invasion of multidrug-resistant S. pneumoniae strains from the nasopharynx after simultaneous osteotomy of the cranium and facial bone in intracraniofacial surgery . Similarly, other nerves of the head may also be important targets for infections, since pneumococcal meningitis is more likely in patients who received cochlear implantation through the surgical insertion technique in proximity to the auditory nerve in the inner ear (cochlea). Occasionally, in the presence of acute otitis media, it is possible that S. pneumoniae can reach the CNS via the auditory nerve . In summary, our data offer novel evidence that SCs could be essential for pneumococcal cells to escape phagocytosis and killing by innate immune cells. On the other hand, the results also support the idea of SCs as immunocompetent cells of the PNS that can mediate an efficient immune response against pathogens via MR.
Financial support for this study was provided by the Vice-Presidency for Postgraduate Education of the Universidade Federal do Rio de Janeiro (CEPG/UFRJ), the Brazilian Council for Science and Technology (CNPq), and the Rio de Janeiro State Foundation for Research Support (FAPERJ). We are grateful to Dr. Tatiana C. Abreu Pinto for help with bacterial cultures and to Dr. Grasiella M. Ventura for her assistance in obtaining the confocal images. HM-R and WB-d-C conceived of the study. HM-R and AFB performed all experiments, except the isolation of the primary Schwann cell cultures. VTR-R and AC-R performed the primary Schwann cell cultures and the infection protocols. HM-R, AFB and LA participated in analyzing the data. HM-R, SA, VTR-R, LMT and WB-d-C participated in designing the study and wrote the final version of the manuscript. LMT and WB-d-C participated in the design and coordination and helped to draft the manuscript. All authors read and approved the final manuscript.